Volkswagen Group is bracing for another blow from the U.S. government. After agreeing to spend more than $23 billion to clean up its diesel-cheating scandal, the company risks facing further obstacles from the administration as it tries to start afresh with American consumers. With the best-selling Jetta and iconic Beetle both made in Mexico and limited production in the U.S., VW is particularly vulnerable to President Donald Trump's proposed "big border tax" of as much as 35 percent. "It would be catastrophic," said Fred Emich, general manager of a Volkswagen dealership in Denver, Colorado. VWs already cost $2,000 to $3,000 more than rival models from Honda, Nissan and Toyota, making it difficult to imagine consumers would accept further price increases, he said. For years, Volkswagen missed the mark with cars that were too small or expensive for American consumers. The diesel scandal undermined efforts to gain traction with buyers, tarnishing its brand image and damaging relations with the regulators the company misled for years about its vehicle emissions. 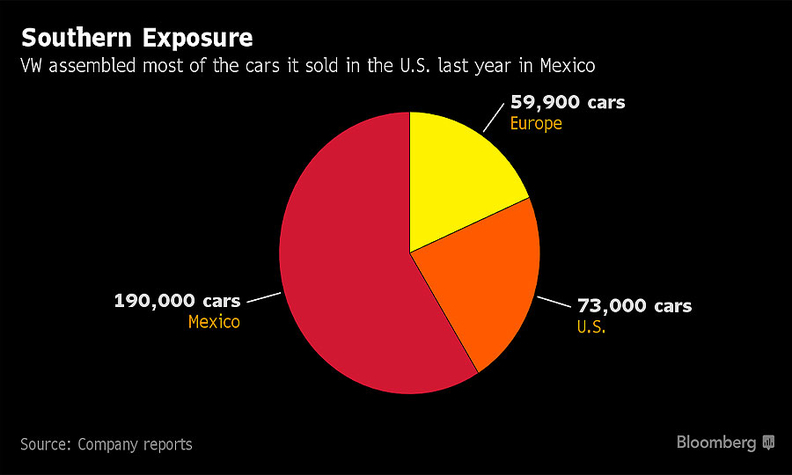 Its next predicament could stem from decades of relying on Mexican factories to serve U.S. buyers -- about 60 percent of all VWs sold in the U.S. last year were made south of the border, at odds with Trump's focus on American jobs. Much of Volkswagen's North American output comes from its sprawling Puebla plant in central Mexico. The factory opened in the 1960s to produce Beetles and is the company's biggest outside of its hometown of Wolfsburg, Germany. Puebla has capacity to build about 600,000 Jettas, Golfs and Beetles a year. By contrast, the automaker's only U.S. factory was built to produce about 150,000 vehicles a year, though an expansion to add a $30,000 SUV called the Atlas boosts capacity to 250,000. Trump has threatened to tax automakers from Detroit to Tokyo that are planning Mexico factories to supply the U.S. He’s also said to have warmed to the so-called border-adjusted tax on imported goods sold in the U.S. being crafted by Republican lawmakers. Most of Volkswagen's rivals are better positioned to stomach a trade war by adjusting production. Nissan Motor Co., which manufactured 850,000 vehicles in Mexico last year as the country’s largest auto producer, also produced 1 million vehicles at its four U.S. factories. While German peers BMW Group and Daimler are developing Mexican production capacity, they both have sizable operations in the U.S. Daimler owns Freightliner trucks and produces Mercedes-Benz cars in Alabama, while BMW's largest factory worldwide is in South Carolina. Volkswagen's imbalance could also get worse. Its luxury-car unit Audi doesn't have a U.S. plant and opened a new factory in San Jose Chiapa at the end of September. Audi plans to export about one third of the Q5 crossovers produced from the facility north of the border. After its recent run-in with U.S. authorities, VW is ill-placed to appeal for leniency, even though its U.S. headquarters is just 25 miles from the White House. The automaker covered up its diesel-engine deceit before admitting to rigging cars for years to deliberately cheat on emissions tests. "For the automaker that's closest to Washington, D.C., they have the least amount of influence," said Dave Sullivan, an analyst with consultancy AutoPacific Inc. "They don’t have the ability to ask the government for any type of favors or help right now." For all its challenges, VW isn't defenseless. The company can point to its growing plant in Chattanooga, Tennessee, now producing the Atlas SUV in addition to the Passat output already there as part of a $900 million expansion. It also has long legacy with Americans associating the brand with Herbie the Love Bug and the hippie-era Microbus. "Volkswagen Group has been a part of the American culture for six decades," said Jeannine Ginivan, a spokeswoman for the company's U.S. unit. She declined to comment on the potential impact of import taxes. "We look forward to working with the new administration and Congress as we seek to grow our presence in the U.S. market." The automaker's expansion strategy is focused on building a range of SUVs, which will involve delegating more decision-making closer to American consumers. The goal is to end decades of futility attributed to having run U.S. operations primarily out of Germany. "Volkswagen needs to spend a lot of time in the U.S., and they need to regain the U.S. consumer," Arndt Ellinghorst, the head of automotive research at Evercore ISI, said on Bloomberg Television. "The incremental investment for Volkswagen will probably come in the U.S.," regardless of the Trump effect.